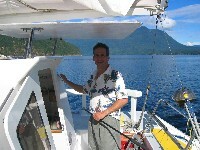 design features for a cruising sailing catamaran. will go into the purchase, design, or designer selection process with your eyes wide open. One of the design features we have come to really value on our catamaran is easy and safe access forward. and then you just walk down a protected walkway. to a larger boat where the hull access is through the bridgedeck cabin. is joined to the hull. 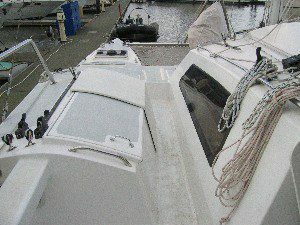 the boat is your typical mini-lifelines (trip lines). to douse a jib or spinnaker on a dark and stormy night? down, the cook is somewhat isolated and can get a little queasy in rough weather. It also tends to be quite warm in the tropics. steerable. In year two we added lines from the engine to the tiller steering. makes a catamaran highly maneuverable. than having it down in one of the hulls. use of furling unstayed sails off a bowsprit. These sails are called “screechers”. 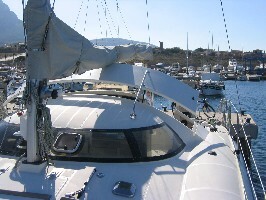 retractable bowsprits have become common sight on many cruising catamarans. In 2001, we added a folding bowsprit and screecher to our cat. Wow, what a difference! and have easy access to the beach. with raising the rudders in thin water.